Chapter Excerpt from a debut novel. Maybe they were making room for him? It all happens very quickly, but that morning, just a couple of days after the George Davis release, when the house is surrounded and then the neighbour is led away, hands behind his back, gut spilling out of his vest, that’s the thought that goes through K.’s head, watching the whole thing from behind the curtain. He’s heard that phrase before, ‘one in, one out’, when they’re made to run through the verruca tank before swimming. Maybe it’s the same thing with prison, he thinks, and now that the old lag, George Davis is out, there’s room for one more. Perhaps that’s what it’s really about, sorting out the timing, a bit like batting. After he is taken away, other uniforms stand by the door while a procession of bags is brought out of the house. One of them breaks and K. sees what looks like a gas mask fall onto the pavement outside. There are also some weird looking sticks, all black, and several handcuffs not unlike the ones the neighbour was wearing when he was led away. Two of the uniforms are smirking, but the third, a woman, is struggling to see the funny side. And when another of her colleagues emerges from the house with a roll of film in one hand and a clutch of magazines in the other, he looks ashen faced. ‘It’s disgusting,’ he says, though to K. he just sounds pretty much like any one of the boys from school when they’re trying a bit too hard to make a point. It takes the uniforms a while to bag everything up and make their enquiries. When Mum answers the door, they seem surprised to find a woman in a sari looking them in the eye and asking them what kind of a pervert has been living next door to her children. ‘Er, it’s not exactly clear that’s what he was,’ says one of them. ‘I suppose you don’t have any proof,’ replies Mum, making no effort to disguise the sarcasm. ‘You’ve done that before. It didn’t help,’ says Mum. K. joins Mum on the doorstep. This time he squeezes her hand, and she’s immediately grateful for his presence, squeezing back, thinking this isn’t exactly the life she had pictured for herself those sleepless nights alone on the ship, homesick before it had even left Bombay, the captain increasingly concerned when she failed to appear for dinner day after day, stomach knotted tight, clinging to some last vestige of home, the rotis filled with shukhna aloo prepared and handed over by hands wringing every last drop of love from that pier, the Arabian Sea already beckoning, a terrified young woman desperately preserving through willpower alone the final speck of kalonji before it would disappear forever in the beast’s curdling waters. Yet it was from that same tumult that a foghorn would rise, its sound sending passengers scuttling onto the deck, and then, yes it’s unmistakably him, waiting for her at the dock in high-waisted trousers with a pleat, for some reason she can still see those as if it were yesterday, and is that a smile or is it relief? She can’t tell, but in his other hand the train tickets to London already booked and a little shawl, which he wraps around her before something sharp, whistling in from a Northern sea, can pierce through the cotton. Back then it was nerves, all that unfamiliar that had first kept her awake then brought her to the threshold. Now, in the space of a few short years everything feels so familiar, more like a sickness, and though it doesn’t begin or end with these uniforms she wishes they’d just go away. Had it always been like this? She wasn’t sure, but the pressure of K.’s fingers on her palm brought to mind another child, herself, at roughly his age, or perhaps even younger. A little girl holding onto her dada’s hand back in Dhaka. There had been monsters back then, too, bigger ones than the bhoot next door or the one looking at her now in his unimpressive uniform. Back then all the beasts had been bigger. Wilder too. But somehow that was part of the excitement, a larger world and its dangers coming into view for the first time. A little girl digging into her dada’s arm as the beast drew near and her heart began to race. Nishash prai bandho hai aasche. Ekta bishal shobdo. Gaatch shob uriegache. Eybar o aashlo. Chitka. Shomosto polapan jara shamnay boshe aache, chitka korche. Ta poray kanakaati. Just a murmur to start with. As soon as the lights go out though a little ripple of unease, running from one end of the benches to the other. All day she had badgered her father to be allowed to go to the cinema, and in the end he’d relented, won over as much by her persistence as by the imploring note in her eyes. In a faltering voice she’d said her dada had already agreed to take her, and when that was met with an amused silence, had added that her older cousins, and an uncle would also be going. It wasn’t far from the house, and if they were all going anyway, there was nothing to worry about. Chinta koro na, Baba, aami odeh shonge thakbo. Orah neaashbe aar deaashbe. She hadn’t stamped her feet or made any kind of a scene, and her father, the professor, liked that. Yet another way in which she was so different to her older sisters. The eldest, also the most wilful, already married and with issue, and the next two most senior, though still at home, biding their time in that permanently alert condition broaching childhood and its remnants. Not yet women, but neither were they children any more. It was his duty to find them good marriages, in homes where they would be appreciated. Where they could grow to be women and raise families of their own. He knew from his own family, from several of his uncles, in one of whose households he’d largely been raised after his own parents had died while he was still very young, that not every match was a good one, and he had seen first hand the unhappiness this created. Wives and children largely abandoned to fates they’d never chosen. Hunger and longing and the bitter realisation that this life apportions cruelty to those least able to withstand it. He had heard the rumours of secret dalliances and a weakness for the flesh. Heirlooms squandered on liquor and nocturnal trysts. Brahmanical virtue and castles of sand, piety slipping away with the other masks. He had also heard about the other families, the other children, the other wives occluded just the other side of the shame. But he had actually tasted the hunger, and he knew it was physical, as with those other hungers which had caused this despair. It was why he understood philosophy, its corporeality, long before he knew its name. To his mind, it came with a physical aspect. Tongues sharpened by hardship and bodies fed with resentment. Which is how he had always known, from a very young age, that impermanence was as much, if not more, a part of this life than any fineries. He had set that knowledge to studying, and learning, then teaching every spare moment that wasn’t given over to fixing, and mending: whatever fetched up in the godown where he had secured some temporary work. The careless details of everyday neglect. Bicycles, cloth, the crumbling spines of ancient tomes. Some other world disappearing in the cross-stitch, in the threading and pasting and repurposing. Each mended garment, or wheel, spinning calloused hands that little bit further from their torment. Every yellowed page caressed with love another possibility away from the jaundiced memory. Betrayal and its subsequent hardships absorbed in a dedication to the work itself. The restoration of spines an undeniably physical metaphor, mind and body once more realigned. By which point even the young man’s detractors – and there were many, who decried both the shame of his high-born poverty and his willingness to work with his hands – started to recognise the value of that work, and of the mind which processed it. And where once the whiff of scandal and loss would have clung to him like an albatross, there was now a presence about this young man. An authority even, assigned to books, but assured by labour. Sons, and even one or two daughters, of the wealthier business people who still for the most part controlled local affairs, would be sent to the young man they had already begun to call master moshai. To help them prepare for their school finals, or in some cases presumably just to imbibe through proximity some of that intellectual authority. And though he was young he understood his function within such arrangements. To provide an aesthetic flourish, an artistic sense, by way of the mind, or to soften a machinery founded on commerce, and calculation. Just make an effort to listen to master moshai. He’ll tell you how. So these callow young people, who if fate had taken a different turn could just as easily have been his peers, would reluctantly sit in what appeared to the young teacher to be the palatial surroundings of their family homes, which sometimes even came with marble floors, while he attempted the often hopeless task of fine-tuning a largely non-existent artistic sensibility. But he knew he was accruing credit in the eyes of these families. That even on the marble an impression had been cast. So he persevered. And when the time eventually came, as everyone knew it would, for the young teacher to move to the big city and pursue his own studies there, it was with the support and financial blessing of one of these influential local families. The philanthropy, if it could be called that, coming from a merchant whose daughter had married well, her in-laws impressed with her knowledge of the Greek philosophers as well as an in-depth appreciation of Bengali literature. Once there, in the big city, the young man, now a student again, rejoiced at its array of voices, its spines which had remained intact. And he drank from every literary pore, slaking the thirst only known by the once forsaken or the exceptionally hungry. That reputation for thoroughness, first forged in the twilit godowns of his youth, now took shape in a promising academic career. Knowledge, and its applicability, finding a home in Philosophy. The presentation of a life not yet fully formed. Ethics as much as aesthetics, hence swadeshi once the bodies had been fished out of the well at Jalianwala Bagh. The fineries of English institutional dress put away in disgust. Though no one ever suspected the disgust of the young professor might have stretched further than a simple sartorial shift. Away from the Greeks and towards the angrier voices, the closer ones inhabiting this agora. To harbouring freedom fighters, whom the Ingrezi called by another name entirely. The professor married by now, and with a growing family of his own. Daughters as well as sons. And whilst a part of him dreaded the brokerage, the approaches that would inevitably be made and the conversations that would unfold, he recognised that it was his duty to set the tone for those negotiations. To be present and, if need be, protective, but in a manner befitting his status. A professor of philosophy and a man who’d already earned the respect of his peers by taking a stand. Wisdom literally homespun since the massacre in Amritsar. Swadeshi but without any of the humourless severity that sometimes implied. He encountered plenty of that within his Department. Speeches, styles, a sectarian tint from mouths which he suspected were unused to hunger. And even then, as the youngest professor in the history of his Department, that didn’t feel right, somehow. The examined life, the one worth leading, meant sacrifices, of course it did. But it called for generosity too, not this descent into reduced madness. For if his cloth was homespun, his tastes were much broader. He loved Chaplin, and that walk. Beneath the hat and the jaunty shuffle, those hungers, too, were familiar. How they could also nourish and restore, though in another breath he knew they might just as easily consume, or leave their bearers consumed with desire. He had known this all his life, that desire was never innocent, yet here were his esteemed colleagues, enraged by rhetoric in ways that were anything but considered. So he found other ways to make a statement. Through an informal network of concerned souls, of which, in that district, there were many, and under the guise of hiring temporary cooks or cleaners, he incorporated outlaws into his household and so fed hungers for something bigger than self. Subversion hidden in plain sight and the Ingrezi eventually gone. Chaplin was useful in other ways too, imparting humour as its own homeopathy. Which in his ever-expanding household, its mosaic of girls and boys and curiosity, proved as useful as anything Vedic. Besides, what was the point of all those books, all those hours spent poring over dusty tomes, if he couldn’t now find some words for his youngest daughter, gazing at him with those innocent eyes that he found so hard to refuse? Her cousin, Shankar, had been to see a film the previous month, and it was all he could talk about. He had apparently also seen a tiger in the street a few days earlier. When he’d excitedly told her this, she’d felt glum. She never saw anything. Films or tigers or even monkeys, which everyone else saw all the time. ‘Ekta Bandar aashlo, ar thik or paacha e upureh ekta thapar boshie-dilo’. She had laughed, along with everyone else, everyone, that is bar her didi, whose bottom was the one being slapped by the monkey. Her didi had earlier caught the monkey in the act of stealing some papaya and had sent it on its way with a firm slap on its bottom. And of course in this telling, the creature had bided its time, waited until nightfall to seize its chance. Her didi had ventured out to use the roofless outhouse – this was at their home in the countryside – and while she was cleaning herself afterwards, the monkey, which must have been watching her, had swooped down into the exposed outhouse and delivered the decisive slap. That was when Shankar had mentioned the tiger, but although he had been called pagol by the others, she didn’t know why. In her head there were animals everywhere but for some reason they were always choosing to hide from her. The cinema hall Mukul was on Nawabpur Road right before Victoria Park. As they arrived they saw its well-decorated marquee at the entrance and walls pasted with big posters announcing forthcoming features. Besides Mukul, there were some other cinema halls within walking distance but when she asked him her dada was unsure where these were. He seemed a little annoyed that he had to hold her hand as they went in, but once he saw that the foyer was full of boys, and girls, like his sister, also being chaperoned by older brothers, and cousins, and fathers, he relaxed a little. As they were in a big group, and had arrived early, they had spent some time outside beforehand. Her dada had picked up some jhal muri from one of the roadside hawkers and though he seemed to be enjoying it, and had offered her some, she had refused when she caught its spicy aroma. To her, there was ekto paad-e-gondo about the packet. She told him and he laughed, though the ferriwala didn’t look very pleased. To placate him, her dada bought another packet which he then gave to her cousins, who had also come along with them. She was briefly tempted by the pickled amra that another hawker was peddling, but it was already getting close to the time that they would have to go inside, so she decided against it. They sat on the benches at the very front. She saw that apart from their group, made up of all the younger cousins and herself, as well as her dada and chotokaka, more or less the entire row was taken up by boys and girls her age. Looking around, and from the excitable voices making themselves heard over one another, it soon became clear to her that the cinema hall was full of groups of young children, with each batch being supervised by an adult. The noise was incredible, louder than anything she could ever remember hearing, and as usual the boys were keen to make the most noise, just like her cousin, Shankar, who even now was telling people (strangers in the next row, not even their relatives) about the tiger. He didn’t seem at all worried about any of it. She saw her dada turn around to see who was making fun of her cousin, now that he’d finished the jhal muri and both his hands were free again, but just then the cinema hall was plunged into darkness. All of the shouting and noise of just a moment earlier magically evaporated, sucked away along with their courage by the pitch black. She found herself holding onto her dada, sat next to her. She watched transfixed as the ship prepared to set sail for the South Seas. The city it was leaving from looked incredible, busier than any place she’d ever seen, even Dhaka. There were so many people all running around and shouting, and so much noise. And though she could understand why Ann, the actress, was getting onto the ship, it still made her feel uneasy, like one of Shankar’s stories. It was an adventure; that was why she was going. And that made sense. She had wanted to see the tiger as well, of course she had, but Baba had told her they were so much bigger than either herself or Shankar. What if the tiger was angry? They would have to run away and she wasn’t sure she would be fast enough. What if it just didn’t like little girls? Would Shankar stay and help her, or would he leave her to deal with the tiger on her own? These were important questions. Baba had said that to her once, when she asked him what he was doing, every day sat there looking at his books. I’m looking at the important questions, he’d told her, and then he’d laughed. But what were these questions? He’d not said. If Baba didn’t know, she somehow doubted Shankar would know what they were. Then again the goree mem on the boat didn’t seem so sure either. Perhaps nobody knew, and that’s why they were all running around this strange city shouting, or hiding? She felt her breathing quicken when the island emerged out of the fog. She could understand why it was exciting, why the sailors wanted to explore the island, but she knew it was wrong. They should never have come this far. Something bad might happen to them. And the deeper they went into the island, the more she felt this in her stomach. She was glad her dada was next to her. Every so often she could tell out of the corner of her eye that he was looking at her, and this made her feel better. Perhaps she needed to do this more? Look out of the corner of her eye, pretend she was looking at, or doing something else. There was that one time when she had seen the new cook putting something in a cloth bag and then hiding the bag under the floorboard. She had pretended not to see anything, and in any case he hadn’t seen her, but it was exciting to think he had a secret that only she knew about. At least that was better than thinking about his cooking, which was terrible. Ma had been getting fat again and so she couldn’t make food every day, but his food was terrible. He couldn’t make rice or dhal or anything really. But no one ever said anything about it, and when she got less fat again, Ma was able to show him how to make begun bhaja and mooshori dhal. Then the police inspector had come and Baba had said something to him and the police inspector had left looking very unhappy. She remembered that. And not long after that the cook had also left but she didn’t know if he had taken his bag with him. Even so, she still felt a little jealous. It was Shankar who had seen the tiger. There was a huge noise. She was finding it hard to breathe. All the trees and the foliage were being uprooted. She heard thundering footfalls, which felt as though they were about to land on her head, and then suddenly, there he was. Ann, the actress, squirmed at the altar where the tribe had tied her a little earlier. She had known there was big trouble ahead for Ann the moment the chief struck the huge gong. And that was when the other noises had begun. As soon as the monster appeared she dug her fingers into her dada’s arm. But at least she wasn’t screaming, like all the other children sat in the front row. 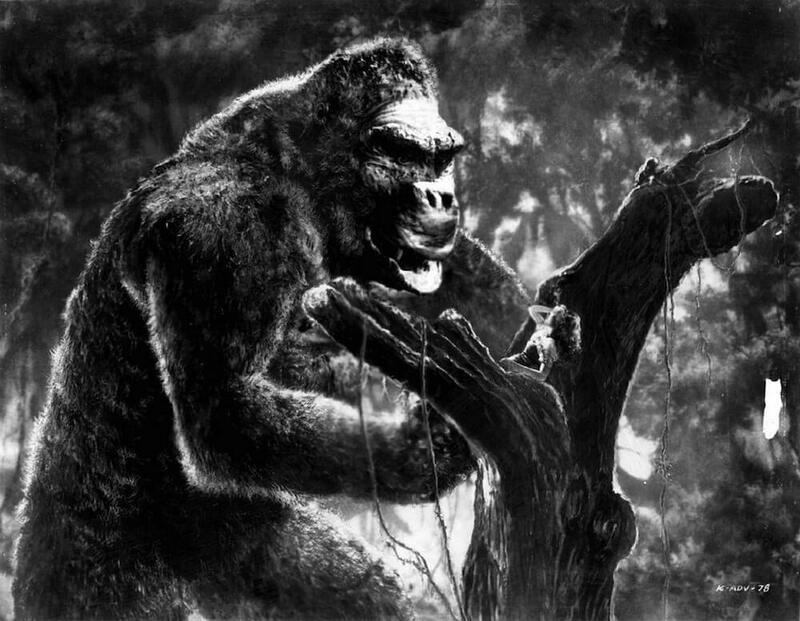 Once the giant gorilla disappeared into the jungle with Ann held in a huge hand, that was when it really started. Serpents, dinosaurs, explosions. She remembered a moment of shocked silence, and then one after the other, and in unison, and then apart again, the cinema hall was filled with the shrieks and cries of children. They wailed through the jungle, and the capture, and the ocean crossing back to that strange city where it all began. And then they carried on screaming through the escape, and the ascent, and the planes. So that by the time the beast was dead, shot down in a strange city, her dada’s arm was marked deep by the pressure of little fingers and the cinema hall was full of that strange paad-e gondo that she’d earlier detected coming from the jhal muri. In the years ahead she sometimes hears that gong, and sees the torch-lit procession, on bad nights when fires have broken out in another para. When rumours abound and no one will sleep. The fires draw closer and there are terrible stories. This bhadralok, that chokra. Until that day it is not a story, but a blood-soaked little boy, unable to speak, who she finds herself washing, and dressing. A boy who had been with his family, trying to leave, when the marquee they’d been tricked into by a ‘security’ detail on the way to the airport was cut down from outside, and a mob wielding machetes had descended upon the stricken shapes just the other side of the tarpaulin. The boy had only survived by playing dead, lying for hours under his mother, her blood salt slowly drying out on his skin. Satisfied that there were no survivors, the mob had moved on by the time he emerged, and it was sheer good fortune that the first person who encountered him wandering bloodied and dazed was her dada, now working near the airport. Shankar is still telling tales this side of the border. Fourteen of them in one room and he makes jokes about jhal muri. But she doesn’t mind that. It’s a reminder of happier times when the only monsters they saw were on a big screen. And if it’s cramped here, she thinks, it is at least safe, and they are together. The years pass and little by little they start to establish themselves in this city. Her dada finds work, Shankar too. From one room they gradually expand to the next, and then to the upper portion of the house too, until they are finally able to call it home. But she has seen what those years of privation have done to her parents, especially Baba. Ma has continued to do what she has always done, to provide food and comfort and advice whatever the circumstances. And she is unconditionally loved for it. But Baba, who she never once remembers having so much as a cough back in Dhaka, is rarely able to speak above a whisper now, his health diminished these past few years. All the wisdoms of antiquity, but a living, breathing ethics shaved to the bone, the shock of departure something from which he never fully recovers. So she makes a promise that she will honour his name, wrestle with those bigger questions herself. She studies by candlelight and is eventually admitted to the city’s prestigious University. And there she enrols to study Philosophy. ‘Aare, bhai, ekto jaiga koro. Didi ke namte din,’ said the young man with a stern look on his face which yet somehow managed to remain simultaneously playful. This was clearly some sort of game for him, the pushmepullyou of the buses, which jerkily crisscrossed the city. Still, she was grateful for his intervention. She had been delayed near the library today and her journey back to Paikpara was far later than usual. It was already dark and promising another downpour, the air pregnant with those early, fat monsoon droplets. By the time the bus lurched its way to the mouth of Tala Park the entire area was submerged, the deluge casting adrift any thoughts of a quick scamper home through the park. Despite the lateness of the hour the bus was still packed, and it took the young man’s exhortation before space miraculously appeared and she was able to alight. Seeing her hesitate before taking a step into the waterlogged street, the young man, who she now recognised as one of the local toughs, scooped her up in a sinewy embrace and carried her the short distance to the first dry spot he could find, under an awning near the park entrance. She briefly thought about protesting, but was dissuaded by the purposeful manner in which the young man waded across the street bearing his cargo. Once he’d satisfied himself that she was indeed now on dry ground, he turned to leave, but before he did so, said to her in a very matter-of fact way, ‘Oto deri te kanno baire, didi?’ She was stunned but before she could answer, he added, ‘Professor moshai kamon aachen aajkal?’ If not exactly the dialectic, then there was still something in this encounter which brought to mind what she’d been studying earlier, until she had lost track of time and made her slightly panicked way home. The treatment meted out by Zeno to Socrates in Plato’s dialogue, Parmenides. She was still considering the young man’s questions when another hand firmly grasped her arm. It was her dada, who must have been on the lookout for her, concerned about the lateness of the hour and her failure to come home. This time there was no hesitation. She felt relieved, gently digging into his arm as she once had in a darkened cinema hall. The local young tough’s eyes aren’t the only ones which are on her though. She is spied by the acquaintance of another refugee family, and a report is made that there might be a suitable match with one of their boys, briefly visiting from Vilayet. The boy has expressed a wish to get married before he returns to London in a matter of weeks. His father has already passed and his mother is ailing, and in that broadly unspoken world of whisper and inference, this is taken as yet another sign of their ‘compatibility’. She never suspects until the day her Baba sits her down and says more to her in an hour than he has since all the trees were uprooted and the darkness crept beyond the Mukul. And though she is reluctant at first and cannot willingly comprehend the enormity of what is being proposed, she soon understands that this is not a dialectic. At this time in her life. The last of his daughters. Will finally be able to rest knowing she is settled. Once more, arrangements are made, yet the first time she sees him is on the day itself. She knows from her didis that he is handsome, but she knows very little else about him. And though they are sat within breath of one another, she hardly looks up all day. For all the clamour, and the pushmepullyou of the subsequent days, the respective clans lurching to-and-fro from despair to triumph, each one bargaining away another fraction of the past, she barely remembers looking up. The shroud there even when the material is removed. There for the three unhappy months spent in his family home, a garden compound in Berati where the only joy she feels is the sound of an occasional bandar scurrying up one of the coconut palms. And there, that terrible day, when she finally arrives at the portside in Bombay, gazing in deleterious awe at the gigantic hulk of the SS Himalaya and holding on to every last word which will delay her departure. Tasting the salt in everyone else’s tears and feeling a sickness which never truly leaves her, even after the fog has cleared and her Skull Island has turned out to be a rather grim little place called England. As far back as the author remembers, his head has usually been in a book. The trickster narratives of Brer Rabbit and Anansi, as well as nightly spelling tests and cod liver oil, spooned in by his Mum, got him through childhood and imbued him with a lifelong love of storytelling, if not necessarily of fish oil. Then as a young man, there was the joy of encountering the laconic humour of writers like Sam Selvon and Clarice Lispector, whose brio taught him how an outsider’s perspective often has the edge in making sense of modern life. More recently his work has appeared in darkmatter101.org and 'Verbal' as well as Writers Resist and minor literatures. Read more articles by Koushik Banerjea. All original work attributed to Koushik Banerjea © 2017 Koushik Banerjea.